Raised on Blood Bowl and artificial colourings, Cracker Cola and Ginger Sneer had an ambition from a young age to play Blood Bowl. Throwing and catching Haggis doesn’t make for an easy training regime, but these Orcs had an irn will from the start. 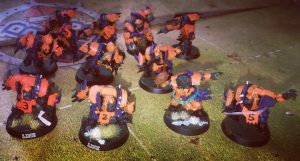 They found like minded players with a love for fizzy drinks and blood bowl, and a rampant thirst for victory. The Irn Bruisers were born, and they stormed the Highland Leagues, drinking down all opposition. The Elven Rangers, Dark Hearts, Mothers Not Very Well and KILL-Marnock were no match for the Bruisers, so they began their march south – Bloodweisers on the Horizon, and Glory Awaits.